If you were going to describe yourself in one word, which word would it be? 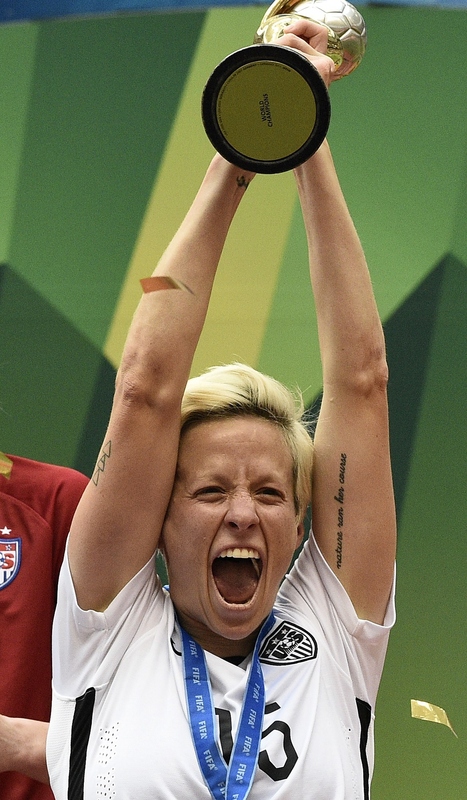 Well, for US Women's National Team soccer star Megan Rapinoe, the word was easy: "Gay!" Or rather: "GAAAAY! ", said loudly and with attitude. Because hell yeah! At a recent event with Sports Center following her World Cup victory, the midfielder was asked to sum herself up in one word. Rapinoe took the opportunity to make all of us fall in love with her all over again by writing "GAAAAY" in all capital letters with four "A"s and a smiley face on her white board — and pronouncing the word exactly the way you think she would. Women's sports in general have been more accepting of openly gay athletes than men's leagues. For instance, 15 of the women who played in the Women's World Cup tournament and two of the coaches were openly gay, compared to zero during the Men's World Cup. Things are still not perfect in women's sports in terms of accepting LGBT athletes (in particular trans athletes); however, it's still true that some of the biggest names in women's sports, like Britney Griner in the WNBA for instance, identify as gay, while the same cannot be said of men's sports. So Megan Rapinoe, we love you. Keep being totally awesome, outrageously talented, and GAAAY!